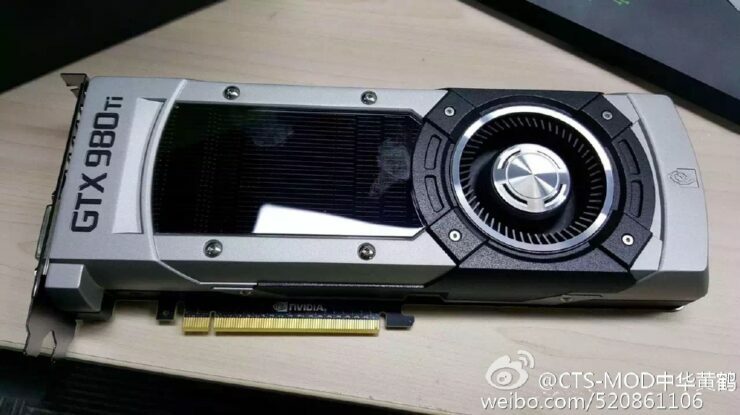 NVIDIA’s latest GeForce GTX 980 Ti graphics card has been officially confirmed to launch on 2nd June at the Computex 2015 event. 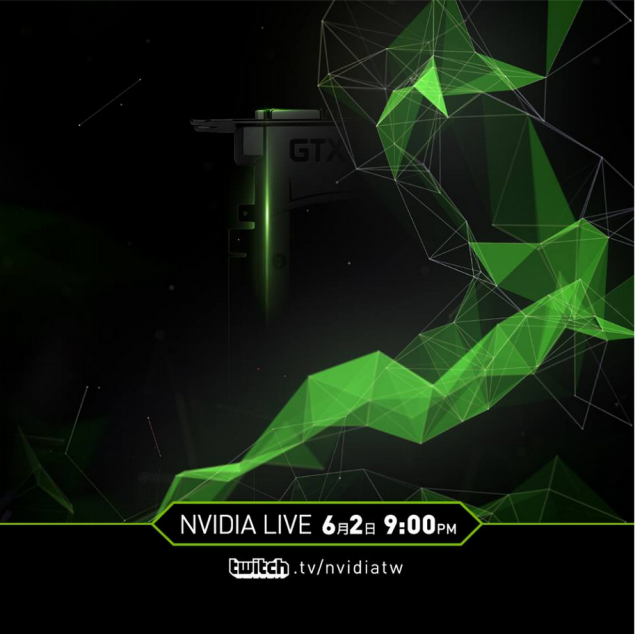 NVDIA seems to be holding a big event at the show to launch their competitive, high-performance, GM200 based graphics cards to GeForce users which will be shown off at the event and live streamed to public via Twitch. The NVIDIA GeForce GTX 980 Ti is going to be the fastest GeForce 900 series cards aside from the Titan X which leads the whole Maxwell pack with an insane core count and 12 GB of GDDR5 VRAM. The $999 US price is quite high and not all people can pay that much for a graphics card (even though the Titan X sold more than the Titan *Original* and even the GTX 690 graphics card. Many GeForce gamers have been demanding for a card that is more optimized in terms of price and performance compared to the Titan X. Back with Kepler generation, users got the GeForce GTX 780 Ti which was better in all ways possible than the GTX Titan and just a few bits slower than the Titan Black. The latest GTX 980 Ti which launches next week is going to be a similar solution that will perform similar to the Titan X but has specifications optimized to deliver lower purchase prices. So specifications, we all need to hear the juicy specifications for this card. The GTX 980 Ti rocks a GM200 core, the specific SKU is codenamed GM200-310 and is a cut down chip that features 2816 CUDA Cores as mentioned in the latest leaks which seem very true. 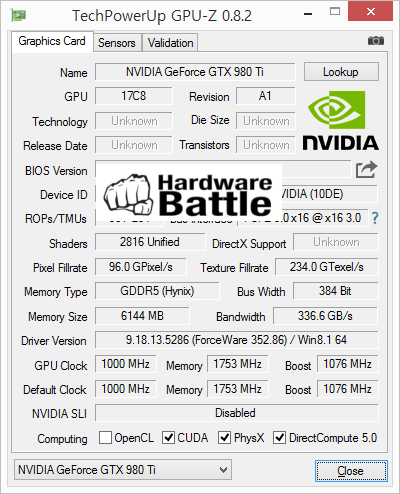 The only site reporting specifications aside from the one leaked by HW Battle is GDM.OR.JP who have rumored a 3072 Core count for the 980 Ti but we don’t think they are correct. So in terms of specifications, we get 2816 cores, 176 texture mapping units and possibly 96 ROPs unless NVIDIA has a new *feature* like the GTX 970 inside their 980 Ti. If so, then NVIDIA might want to come clear with the specs prior to shipping them out to review sites which I believed they did to avoid any backslash from the community in the future. The card does feature a 6 GB GDDR5 VRAM compared to 12 GB GDDR5 on the Titan X. The 6 GB VRAM is more sensible for a gaming card and the memory runs along a 384-bit bus interface that is clocked at 7 GHz to pump out 336 GB/s bandwidth. The core clock is maintained at 1000 MHz and 1076 MHz boost clock. 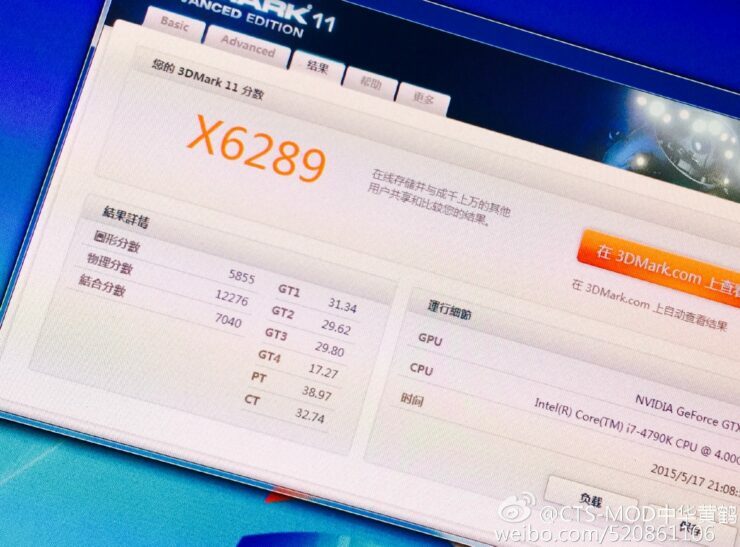 The final clocks and specifications might differ since the GPU-z version does not yet supports the GTX 980 Ti. As for design, the card features a 8+6 Pin power connector configuration and has DVI, HDMI, 3x Display ports for display outputs. NVIDIA is using the reference NVTTM Maxwell revision cooler which has a decent package to cool down the card but to be honest, NVIDIA has to change the cooler scheme sooner or later since it is getting a bit boring looking at that design since the past two years. Custom designs will be available and shown off during the launch event at Computex. Many thanks to our community fellow Kenneth Cheung for the tip! 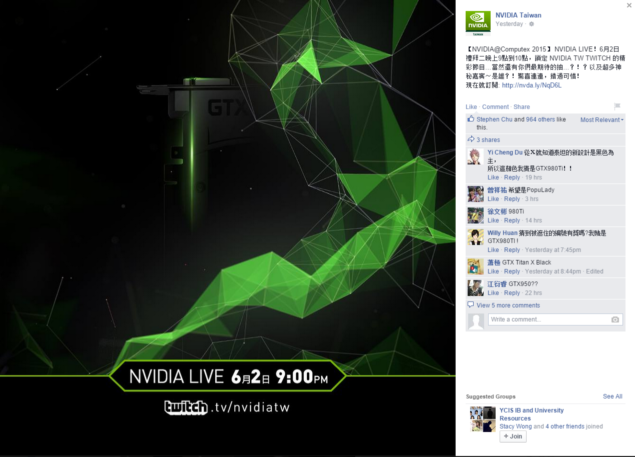 Note: The following post has been removed from NVIDIA’s Taiwan page.